Oak Park, Illinois, 1875. Isabelle Larkin’s future—like that of every young woman—hinges upon her choice of husband. She delights her mother by becoming engaged to Gregory Gallagher, who is charismatic, politically ambitious, and publicly devoted. But Isabelle’s visions of a happy, profitable match come to a halt when she witnesses her fiancé commit a horrific crime—and no one believes her. Gregory denies all, and Isabelle’s mother insists she marry as planned rather than drag them into scandal. Fearing for her life, Isabelle can think of only one escape: she feigns a mental breakdown that renders her mute, and is brought to Bellevue sanitarium. There she finds a friend in fellow patient Mary Todd Lincoln, committed after her husband’s assassination. 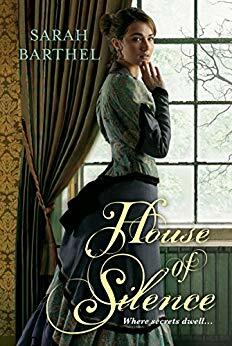 Weaving together a thread of finely tuned suspense with a fascinating setting and real-life figures, Sarah Barthel’s debut is historical fiction at its most evocative and compelling. While this book is mainly billed as historical fiction, it is also very much a Gothic. Isabelle is locked away, her sanity is uncertain, there is an element of suspense, there is a mystery at the heart of it – what really happened and why? A truly enjoyable read that I couldn’t put down. I would highly recommend this book and look forward to reaching more of Barthel’s work.